Just when he though he had the murderer cornered, a neighbor discovers a shallow grave in the orange groves; an unsolved missing person's cold case files. A case that has haunted the Orange County Sheriff’s Department for three years. The evidence in the missing person's case rumples Snipes proficient sleuthing skills as the leads take him in circles. Then to add to the muddying discord, another Harrington turns up dead, apparently murdered in his sleep. But when a sinister child’s Jack-in-the-box, seemingly from the grim reaper himself, materializes on the Colonel’s desk, the detective is bedeviled more than he cares to admit. Nevertheless, Snipes had enough moxie to send fingerprints to every city where his suspects had ever lived. The leads take Snipes in a direction he never saw coming. Within days, he's shocked to his eyebrows by the results; the identity of the murderer befuddles his mind. Alas, the oldest Harrington son, Shep, supposed wife, had a mock wedding to him in Manhattan, New York, and their plan was to kill the whole Harrington clan for their wealth. Ronald James was born during the great depression, and as a toddler watched WPA men build a new street, from his home’s big front window. His playmates were a red rider wagon, a small black satchel and rocks. By using his imagination he had conversations with mythical street workers that bloomed into fashioned fantasies by age four. He used cardboard boxes to create fun spaces for his neighborhood playmates to enjoy and he kept telling stories all through high school. In college he abandoned writing and studied architecture. James had a successful architectural career and retired, however he wanted to keep his creative juices fluent, so he returned to his childhood story telling days and joined a writers group. 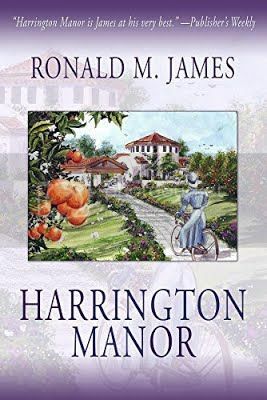 Like architecture, each day he couldn’t wait to create, finish, and start new stories—like, Harrington Manor.